Richard Gordon, Fifth Avenue, New York City, 1977, gelatin silver print, 9 1/16 x 6 1/16”. Richard Gordon was a very “slow” photographer, a patron of the patient viewer. His many subjects were often quotidian, well framed, and densely layered with meaning. So slow is the impact of his work that it may take a long time after Gordon’s recent death, on October 6, for him to assume his rightful place in twentieth-century photographic history, alongside fellow Leica wielders such as Robert Frank, Lee Friedlander, and Helen Levitt, all of whom have been the subjects of Gordon’s prolific art criticism. This exhibition of black-and-white photographs from the 1970s emphasizes the slow, subtle genius of Gordon’s work, most notably in his prescient “Meta Photographs” series of that era. Meta Photographs was also a photo book that Gordon self-published in 1978. It is filled with poignant, self-referential images, straight photographs satirically pointing out the cemented presence of the camera in the everyday. Gordon shot people taking photographs; doors and shades printed with photographic images; windows filled with taped-up snapshots; and views framed by windows to look photographic, in spite of their very “real” quality. Ventnor, 1975, a prime example of this body of work, depicts a television set displaying a scene wherein a man and a woman approach the back of an enormous camera, about the size of a trailer. The back, visible, looks somewhat like the back of a Leica, as though the TV screen were a sort of reverse mirror, allowing Gordon to photograph the view behind his own camera. 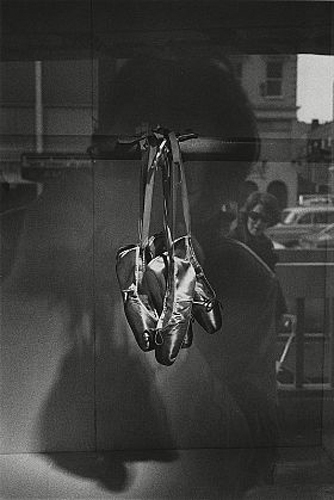 Gordon’s love of metaphysical implication extends far beyond this series; Fifth Avenue, New York City, 1977, for example, shows a pair of ballet slippers on display in a shopwindow, becoming a loaded placeholder for the fetishistic nature of commerce uptown. In all these works, one is struck by Gordon’s attentiveness to elevating his mundane subject matter, through the gorgeousness of his compositions and the beauty of his prints, which leaves a lasting impression on the viewer.